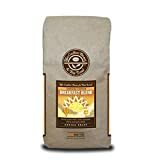 Coffee Bean & Tea Leaf Brewed Coffee is found at The Coffee Bean & Tea Leaf Cafes throughout 13 States in the USA as well as The District of Columbia. Their brewed coffee comes in many different blends and the above amount reflects the average amount of caffeine a customer may expect to find in their Regular Brewed Coffee. Here's how their other sizes compare. Their coffee of the day is available in light, medium, and dark roasts. Lighter roasts have slightly more caffeine than darker roasts. Their are many factors that can influence the overall caffeine content of Coffee Bean & Tea Leaf Coffee like brew length, quality of coffee, and accurate ground coffee measuring. Coffee Bean & Tea Leaf's customer service stressed that these are average amounts based on industry standards. In any event, Coffee Bean & Tea Leaf Coffee's caffeine level is pretty high and comparable to the amount found in Starbucks coffee. We also list their iced coffee here. Coffee Bean & Tea leaf Coffee contains 20.81 mgs of caffeine per fluid ounce (70.38mg/100 ml). Data Sources: http://www.coffeebean.com/ and phone call to customer service.